Celebrate Mexican heritage in this Día de los Muertos Child Costume! More comomonly known as Día de Muertos these days in Mexico, the Day of the Dead is a southern Mexican holiday celebrating the life of deceased loved ones. Though it coincides with the Christian traditions of All Saints’ and All Souls’ days brought to the New World by missionaries, its origins can be traced back to Aztec festivals celebrating Mictecacihuatl, the goddess of death and the underworld. The bright colors on this Día de los Muertos costume add a dose of fun to the holiday alongside candy skulls and papel picado. It’s fun as a girly skeleton costume too! Maybe your youngster has a love of all things macabre and she wants everyone to know. Is her favorite movie is Corpse Bride? Does she keep asking when she’ll be old enough to see The Sixth Sense? Maybe her bedroom wall isn’t adorned with posters of Justin Bieber or Zayn Malik but of Edward Cullen and Jack Skellington. Short of letting her get that real human skull she wants, this Día de Los Muertos Child Costume will scream her passion for death to the world like nothing else. Just make sure she understands she’s got plenty of time left among the living. 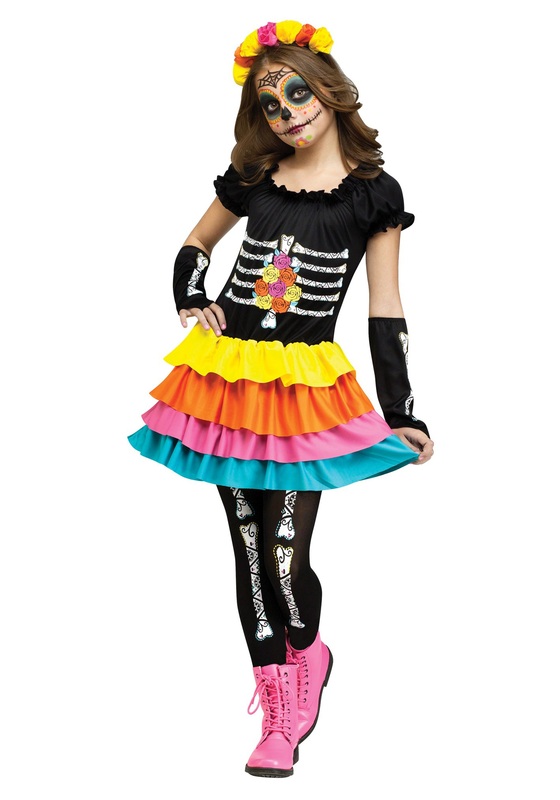 This Día de los Muertos Child Costume includes a 100 percent polyester knit and tulle interlock pullover dress with an elasticized peasant neckline and built-in tulle petticoat with printed flowers and bones and the bodice front, ruffled tiers of yellow orange and pink fabric on the skirt, and sleevelets with printed-on bones. Ninety percent nylon, 10 percent spandex stretch knit tights have that extra undead flexibility when she needs to shimmy dem bones. Fabric rosebuds glued to a plastic headband top the costume off. We recommend skeletal face paint to complete the look!